6:15am... Ring ring... hello, you are live on the radio! These interviews were set up by Heart Of Gold’s publicist, Angela Vogt, and really show the value of having someone to handle PR. Great coverage and penetration on a very important local level ahead of time and not post festival which is near useless. In these live interviews, you get the call and the host says ‘Hi, how you doing? So we are on in 30 seconds… Hold please… Boom… YOU ARE ON LIVE RADIO!’ It’s quite a buzz in the moment! So first was an interview at 6.15am with Cam Young from ABC Coast FM – you can listen to it here, courtesy of Simon Van Der Spoel (one of our Associate Producers – his email he just sent to me below). Second was a print interview at 6.45am with Jannette Parke, a journalist from The Gympie Times (their our local daily paper and big festival supporter) and finally was a scheduled radio interview at 7.45am with Michael Smith, drive time presenter of 4BC Brisbane, a talk back style station, but this was rescheduled for tomorrow as they had a big news story. They were good enough to call me to apologise and arrange for same time tommorrow. Crikey a days work done before most people get to work in rainy London! I tried hard to name check the festival as many times as I could, which is paramount in these kinds of interviews, as well as talk about the masterclass and the movie. It’s really great doing interviews where the host has been properly prepped by someone, so thank you Angela for a stellar job. So… if you are in Australia, and you want to come along to the Masterclass in Gympie, or even just come to Gympie to see a host of super shorts, you can sign up on their website here. ‘I'm driving along after doing a commercial shoot, and I'm channel surfing on the radio and I come across ABC and here the words "Gone Fishing" briefly before I've moved on...now wait a sec...could it be... I've gone too far on station flicking, have to go around....*hiss* *static*... "Chris Jones...shortlisted...Heart of Gold"...*static* Up next....Chris Jones! I had a fantastic meeting this morning with the publicists who have been offered to us by the very nice people at Actix, who have partnered with us on the next, and potentially most exciting step on the Gone Fishing journey. We are lucky enough to have head honcho Julian Tanner, at Axicom Cohn&Wolfe handling the campaign for us. He and his team came over to my flat today to watch Gone Fishing on BluRay - and the response was extremely positive. We immediately started spitballing all sorts of new ideas and angles to get the attention of the press. Of course I can’t reveal what they are just now, but it will require me to fly back form LA in early Feb, and some of them are quite ‘left field’. One thing we have tried to do is come up with a short pitchable angle, as things like ‘it’s a great movie’ just don’t cut it with the press, they need more. Right now we are thinking along the lines of ‘the guy who wrote that book about film making, took all his own medicine and Gone Fishing is the result… and it might just win an Oscar!’ There are other one liners too, so we may not go with that one yet. Happily, they have a sister company in LA too, so I should be hooking up with them next week when I hit the tarmac running. I walked into the office at Ealing Studios today to a barrage of emails and calls regarding the Variety article. I had known about this since last week, but it’s just hit the streets in print, and it’s a WHOLE PAGE! This is very good PR for us as Variety is one of the top industry newspapers and it is read world wide. The article talks about Gone Fishing and another animated short called ‘This End Up’, but it’s the fact that Gone Fishing gets a picture nearly half of the page that really helps. Here is a link to a scan of the article, or a link to the online text version here. WOW! It’s all getting so very, very REAL! As we welcome in 2009, I was delighted to get notice of two separate articles about Gone Fishing in two very prestigious film journals. First off is a great write up in Daily Variety, a piece about how short films contend for the Oscars. It’s really great news for us. You can read the article here on the Variety website. Second is a stunning article in Kodak’s own magazine called InCamera. All those lovely images that we shot during filming have really paid off here, the main shot of Bill and Simon walking down the ‘leafy corridor’ having been snapped by Vernon our DP. You can read the PDF here (or there is a browser version here). All in, a GREAT start to 2009. The new Gone Fishing PRESS website is now up and running. This is a dedicated website for members of the press and is not a film site about the movie. I decided to do this when I noticed while attending festivals, just how reluctant journalists seem to be now, to carry a press pack around with them. And it makes sense too, as I can continually update a digital one, as well as being eco friendlier. The idea is to make geting content to a publication as easy as possible. Like all websites, this will always be work in progress. We are in the throes of updating and reformatting the whole ‘Gone Fishing’ press pack. What we have is great, but it’s a little outdated now, and also, now I have been out there in the world with it, I can see how we can improve it. The big thing I have found is that journalists will no longer carry very much around with them. So it all needs reducing. The plan is to have three basic versions. 1. A business card which directs the person to a special and ‘press only’ website. One URL and you are there, everything at your finger tips. That’s of course the lightest one. 3. A double DVD case with the movie on DVD, a press pack on CD with stills and clips, and a micro reduced paper print out of the press pack that will fit inside the DVD case neatly. The case will have a DVD cover with the words PRESS PACK emblazoned across it - this has the added advantage of being ‘packaged’ where most of the eye catching good stuff is on the outside of the box. It’s shiny too and everyone likes that! 7) Try and make the cover of your press kit unique. Remember you’ll be in a filing system with many other film titles the media will be looking at. All press attending the Festival like to have a press kit on the film they are seeing. This article then precipitated contact with Miramax, who contacted me yesterday expressing interest in seeing the film. Of course I am happy to send them a DVD but I am trying to set up a screening on 35mm in Soho. It’s so much better (and easier) to be invited than it is to bang the door down. This is terrific news and really illustrates that what you get out of these events is rarely what you expect, and often better than you imagined! Awesome. …whatever you choose, you will always do the very least you consider is needed to get the job done. It’s human nature, and commonly called the path of least resistance. So really, my success or failure on Gone Fishing would lie in the choice of logical end to my endeavour, and also in knowing that I would ALWAYS choose the path of least resistance to that end goal – so the trick to success lies in the choosing of that goal – a small hill or the highest mountain? Failure is an almost certain statistical outcome, but failing to climb a hill creates few new opportunities, whereas failing to climb a mountain will certainly open up a new world. So the greater endeavour becomes an almost certain win win proposition. Win if you make it, win if you fail to make it. I announced that my goal would be to win the 2009 Academy Award for Best Short Film. That I felt, was about as big a goal a short film could score. Today I dropped off some framed posters from Gone Fishing, signed by myself, Ivan, Eddie and Vernon. Pictured here is the lovely Rebecca Budds from Midnight Transfer. Rebecca really helped us through some tricky post production problems back in December of last year when we were grading there, with John Claude. She commented how it was nice to hear how the film was doing as many other short film makers rarely get in contact after they have been given help at MT. So there is a lesson for us all there, to involve those who help us, all the way through the life of the project. I also met with the equally lovely Martin Butterworth from The Creative Partnership. Martin designed the poster in the first place and the flying hook and beautiful blue skies were all his ideas and execution. He was delighted with the poster and we had a quick chat about were to hang it – perhaps the loo, at the least we have a ‘captive viewer’ in those most private of moments! Framing and giving these posters and presenting them to these companies serves two purposes. First off, it is a small token of gratitude for their help in the first place. Second, all these guys work at a very high level. Creative Partnerships reception looks like a West End cinema lobby with ALL the posters from the latest big films – posters that that they designed. 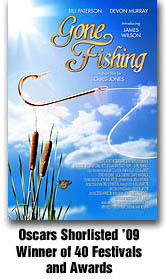 This means that if a Gone Fishing poster is hung in reception, if only for a week or three, all those important ‘film people’ who are wandering in and out might see it (remember I gave them signed copies in a frame, ready to be hung)… and that may jog their memory when it comes to the BAFTA’s and the Oscars. Key to our success now is visibility – and without a huge budget, we must be cunning in getting the film out there is a highly targeted manner. And this is a great place to start. I want to introduce to you Ian who is going to be our Captain Facebook in the army that we are assembling – mission objective? January 22nd and The Oscars 2009 Nomination for Best Short Film. And yes, that's Ian making a characteristic leap of faith! 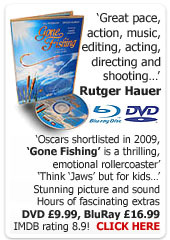 Hi everyone and thanks for offering to help with the online promotion of Gone Fishing. In order to help publicise the film on facebook, would you mind helping us with a number of tasks? The whole thing should take about as long as it takes to watch Gone Fishing! On facebook, goto http://www.new.facebook.com/pages/Gone-Fishing/68634785374 and click "Become A Fan"
Post a message on the wall saying why you like Gone Fishing, and what the production blog has taught you about film making. Goto http://www.new.facebook.com/group.php?gid=21115279481&ref=mf and click the join link. Under the column on the right, headed "Invite Friends"click the tick box next to each of your friends (this takes a whilebut it is worth it!). "Hello! Please, please, please support independent film making in Britain - Gone Fishing deserves a shot at getting the Oscar for best short film. Please show your support by joining this group. Thanks, Ian." Post another positive message on the group page (http://WWW.new.facebook.Com/group.php?gid=21115279481&ref=mf). Post a note on your facebook profile relating to one of the blog posts. Go to http://www.facebook.com/posted.php and enter a Gone Fishing related URL into the box under "Post a link" then click "Post". On the next page, select the most eye-catching thumbnail image (clicking the arrows under "Choose a thumbnail" lets you cycle through the options). You are now initiated into our little secret society! To complete your initiation, join our private Facebook group at http://www.facebook.com/group.php?gid=22902109333 - we will use this for sharing as much information as possible so we all learn how to promote our films online in the future. If you have any problems understanding what I have written above, do not hestiate to contact me - I am usually available on the Internet somewhere (skype: readikusmsn, ihr69@hotmail.com, facebook: http://www.facebook.com/profile.php?id=505016383) so will try my best to help! IMDB has finally updated our user rating and we have our score – as write this, it’s 8.6 which is derived from 75 votes – in the screengrab here you can see the breakdown of those votes, which is interesting. IMDB weight these scores, so you will see that we actually have a score of 9.4 (! ), but have been dropped down to 8.6. 'The User Rating score of a title in the Internet Movie Database is based on a "weighted average" of the votes cast by our large base of registered users on a 1 to 10 scale (10 being best). Weighting takes into account additional factors and calculations besides just the number of people who voted and what their votes were. That means it is not the arithmetic average or arithmetic mean of the scores, though those can be seen by looking at the detailed breakdown of the user ratings. We use this formula to help prevent organized groups of people from attempting to "stuff the ballot box" and create an artificially inflated (or deflated) rating for a title. To prevent abuse of the system, we do not disclose what the additional factors and calculations in the formula are. It seems pretty reasonable really. As a guide, Andrea Arnold’s 2003 short, Wasp, which won the Oscar, has a rating of 7.6 (with a ‘real’ score or 7.9). But the great thing for Wasp is the number of votes, which is 386! The Posters Are Finally Sent Out! Finally, the postal tubes for the posters arrived – at the same time as the newest member of Team Living Spirit. Catherine Balavage, pictured here, started today. Hoorah! After being asked why she thought it was a good idea to get cramped into a tiny, overheated, noisy office, her answer was simple… ‘I wanted to be part of the team who made it to the Oscars!’ We like Catherine. She is also a writer and talented actress (she just starred in The Wolfman, $25m remake of the Universal classic, shot at Pinewood Studios), and I am hoping that her wee Scotts accent will help charm some more support out of sponsors. So one of the jobs today was to get the posters that we had printed and signed, off to the people who bought them – which we did, in a very organised production line. We still have a few signed posters left over, signed by me, Editor Eddie Hamilton, Producer Ivan Clements and DP Vernon Layton. So far we have just covered the costs of the printing by selling these posters, but we are still on a funds drive, now the Oscars bid is underway. So now is your chance to get one before they get sent off to festivals. If you want to buy one of the last few signed posters, you can get one here. On the closing night of the Rhode Island Film Festival, I did a radio interview with Toni Pennacchia of Merging Arts Productions, for a Rhode Island radio station. That interview has since been podcast by Toni on her site, Spolier Alert Radio. It features interviews with a bunch of other film makers and gives you a full flavour of the laid back Rhode Island Film festival experience. Can you rate Gone Fishing on IMDB... WE NEED YOUR VOTES! Second, can you rate it out of ten. It’s a bit cryptic how this works as I know e have had more than five votes (it says still awaiting five votes). To vote, or ‘rate’ a film, you will need to register, which is free and takes only a minute. After you have registered or if you already have an account, go to the Gone Fishing page here, and at the top, you will see two sets of stars – the ones on the left are the User Ratings (and we are still awaiting enough votes to get a figure in) and the ones on the right are YOUR ratings. Just hover your mouse over the stars and you will see that they go up and down. Click on the rating you want to give. From the screen grab above, you can see that I gave myself 10 out of 10. In IMDB pro, the big brother to IMDB, we can track the popularity and visits and it can become a vital tool. At the moment we are hovering at a rating of about 35,000, but it will be fascinating to see if these visits and votes can make a big impact or not on this figure – if they do, then we all know for future reference, that it is possible to force a spike in IMDB, if needed for PR. Many thanks for taking the time to vote, it makes a HUGE difference. UPDATE - I have no evidence of this but I suspect IMDB somehow rates users, and people who sign up and vote for one film are not considered as highly as those who vote for multiple films. So please spend five minutes voting for a bunch of your favourite feature films, just for the fun. That I hope will get your vote in the running. Yesterday was the official selection screenings of the Kodak shortlisted films at the Curzon West End. I have written a much lengthier blog entry to publish next week, after the whole event has ended, about my thoughts and feelings regarding the entire experience and the British Film Industry. For now though, this is just a short précis of events. The day started with Sam Clark from Kodak giving each of the eight candidates a certificate for getting down the final eight. Seeing a photo opportunity, I held it high and grinned broadly – unless you were there, you just won’t know if the there were 10 people or 1000 people in the auditorium! As crazy as these kind of pictures are, they are very useful down the line in mythologizing both oneself as a film maker, as well as the film (the pic shows me and producer Ivan Clements and was taken by fellow film maker Suki Singh who is now making a Microwave feature film – good for him and I can’t wait to see the results! I also believe he cut a deal with Sam from Kodak while at the screening, so he is also making the difficult choice of shooting on film. Again, good for him! A good deal is always to be made at events like these).